What does PostgreSQL Full-Text-Search have to do with VACUUM? Many readers might actually be surprised that there might be a relevant connection worth talking about at all. However, those two topics are more closely related than people might actually think. The reason is buried deep inside the code and many people might not be aware of those issues. Therefore I decided to shade some light on the topic and explain, what is really going on here. The goal is to help end users to speed up their Full-Text-Indexing (FTI) and offer better performance to everybody making use of PostgreSQL. Before digging into the real stuff it is necessary to create some test data. For that purpose I created a table. Note that I turned autovacuum off so that all operations are fully under my control. This makes it easier to demonstrate, what is going on in PostgreSQL. In PostgreSQL a GIN index is usually used to take care of “full text search” (FTS). Finally we run VACUUM to create all those hint bits and make PostgreSQL calculate optimizer statistics. 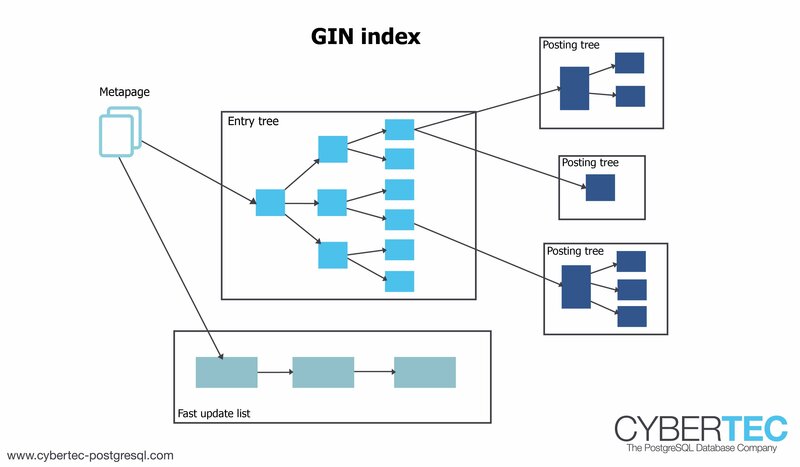 To understand what VACUUM and Full Text Search (FTS) have to do with each other, we got to first see, how GIN indexes actually work: A GIN index is basically a “normal tree” down to the word level. So you can just binary search to find a word easily. However: In contrast to a btree, GIN has a “posting tree” below the word level. So each word only shows up once in the index but points to a potentially large list of entries. For full text search this makes sense because the number of distinct words is limited in real life while a single word might actually show up thousands of times. Let us take a closer look at the posting tree itself: It has one entry for pointer to the underlying table. To make it efficient the posting tree is sorted. The trouble now is: If you insert into the table, changing the GIN index for each row is pretty expensive. Modifying the posting tree does not come for free. Remember: You have to maintain the right order in your posting tree so changing things comes with some serious overhead. Fortunately there is a solution to the problem: The “GIN pending list”. When a row is added, it does not go to the main index directly. But instead it is added to a “TODO” list, which is then processed by VACUUM. So after a row is inserted, the index is not really in its final state. What does that mean? It means that when you scan the index, you have to scan the tree AND sequentially read what is still in the pending list. In other words: If the pending list is long, this will have some impact on performance. In many cases it can therefore make sense to vacuum a table used to full text search more aggressively as usual. Remember: VACUUM will process all the entries in the pending list. I would also like to point you to something else: “shared hit = 5”. The query only needed 5 blocks of data to run. This is really really good because even if the query has to go to disk, it will still return within a reasonable amount of time. 5 pages + 326 pages = 331 pages. The pending list explains all the additional use of data pages instantly. The important part is that the query is also a lot slower again because the number of blocks has decreased again. I think those examples show pretty conclusively that VACUUM does have a serious impact on the performance of your full text indexing. Of course this is only true if a significant part of your data is changed on a regular basis.